Garlic (Allium sativum) is a hardy perennial member of the onion family. Garlic is probably native to Central Asia but has long been naturalized in Southern Europe. Garlic differs from the onion, producing a number of small bulbs called cloves rather than one large bulb. Each bulb contains a dozen or more cloves, and is covered with a thin white skin. The larger outer cloves produce the best garlic. Garlic has flat leaves rather than the round hollow leaves of the onion. Garlic is used largely as a condiment and as flavoring in gravies, tomato sauces, soups, stews, pickles, salads, salad dressing and breads. Many cooks find it indispensable in the kitchen. 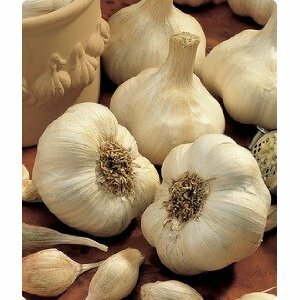 Garlic is easy to grow and doesn’t require a lot of space. It can be used as an edger around the tomato patch or tucked into the perennial garden next to the Delphiniums. The secret to a harvest of large garlic bulbs is fall planting‹generally four to six weeks before the soil freezes. This way the roots can become established before the winter sets in and will be ready to support vigorous leafy growth come early spring.